I started learning about film cameras recently after I have been using digital for several years now, and I'd really love to get into it more and get myself a rangfinder. I have a couple of things that are important to me, and I have a couple of cameras in mind, but I still can't make a decision and would really appreciate some help. - Olumpus DC: cheaper, but I guess it's only auto? - Konica S3 (C35FD): 150-300€, good reviews, only shutter mode I think? - Canonet G-III QL17: it's a bit bigger, but also I'm seeing some bad reviews here and there? What other cameras would you suggest? What are your thoughts? Also, what are the things to look out for when buying? What can NOT be fixed at all? For example here is Konica S3, seems like a good deal, but also says there is dust and funges and so? Are these cleanable? There was also another one that had the battery cover missing, worth it? Is auto exposure a must? At that price point, I'd look at something like a Leica IIIc with a collapsible Elmar. It's heavy, but also quite small. These have their downsides and the rangefinders are a bit squinty, but they're also reliable and virtually indestructible. Of course, theyr'e fully mechanical/manual. The Canons II and IV series are a nice alternative that are roughly the same size and shape as the III series Leicas but with some nice features. Since they share the same mount, you can also use tiny lenses like a collapsible Leitz, or use something like the excellent(and still small) Canon 50mm f/1.8. not a must, but would be nice if reliable. Any reccomendations from Voigtländer? Or other brands? How is the auto exposure of the Olympus DC? What about newer film cameras, with auto focus maybe? The Olympus 35RC is a good choice in 35mm rangefinder: compact (15 oz), shutter-priority (with unmetered manual), good viewfinder that displays both aperture and shutter speed, and a sharp lens (if f/2.8 is fast enough for you). The Canonets are well-regarded by some, though I have used two and can't say that I was particularly impressed with the results from either. Leaf-shutter cameras can be complex to work on, so unless you have some previous repair experience it's probably worth getting one that's in good working condition and complete. Finding a replacement battery cap for something like a Konica Auto S3 won't be easy, as these cameras aren't that common (or cheap). The Vivitar 35 ES (made by Cosina) is also supposed to be quite good, though I haven't tried one myself. aleceiffel and Andy Collins like this. The RC does seem nice, though yes I was a bit skeptical because of the f/stop. When using digital it makes a difference, especially when shooting in low light or when aiming for a nice bokeh or something. It does seem to be somewhere around 100€, too. I have so far found the DC for 100€ as well, and the RD 150-200€. I found a clean Konica S3 for 200€, but not sure if worth it. The Vivitar is also pretty nice now that I'm looking it up, also around 100-150€. People seem to compare it to the Konica S3. And people seem to prefer the Konica S3 over the Olympus. Hard to make a decision tbh, I'm just very confused. All are small, all (except DC) have shutter and auto which is perfect (the DC makes up for it by having a button to focus the metering on a certain spot to kinda get it more right as I've read). Konica S3 has a lock when half pressing the shutter, which is nice, not sure about the others. why not look at an old folder like a retina with a rangefinder or the ikontas? totally manual so you would need a meter or use the sunny rules. pocket folders are cheap n plentyful in working condition. but form your list I see you want auto n more modern. cant help there. Andrew in Austin and Jochen like this. Before spending a lot of money (300 Euro is a lot for me), I'd get a cheap FED or Zorki, or whatever little compact RF you can get cheap, and try that out, to see if you like the RF experience enough to spend more. Find out what battery your chosen cameras need for their meters, and if you can still get it, or a substitute, easily. Also, 'silent would be super as I'd be mostly doing street photography' is odd; if your camera can't be loud on the street, where can it be? I would suggest a Nikon L35AF because of its slightly wide angle lens and its use of AA batteries which can be found anywhere. It is an auto exposure camera with manual focus. I can also suggest the Konica C35EF3 for the same reasons. Both have plastic bodies but I have never dropped a camera. Happy hunting. I'm going to say maybe a Canon P or 7. Neither are that expensive, they usually come with a 50/1.4 and if they don't, it's usually possible to find one used. Check that the selenium light meter is still accurate (reasonably). It's an actual rangefinder, it's well made and a good user, and can use any screwmount lens. Viewfinder is way better than a Leica II or III. Yes I'd like a Leica M2 better but you're getting into a lot more money. Beware though, 7s don't come with a hot (or cold) shoe unless you get the unobtanium clip on version.Which is why you will want the light meter to work. Note the 7s and the 7sZ are both a lot more money but they have a CDS meter which will probably be more accurate. I also like Dustin's suggestion. You could pick up a decent FED or Zorki with Jupiter lens for around US $50 or so, learn on it and then go from there. The prices quoted on the other cameras seem quite high, especially if you're not really sure what you want yet. If you do go for a RC there is one bug that can be fixed for a couple of dollars. Go on ebay and hunt for a 43.5mm to 43mm step down filter ring. You are only going down .5mm and the adapter won't block the metering window on the lens. Just screw it on and leave it on. The 43.5mm filter size is very hard to find filters or lens caps or hoods for. The 43mm size is common. It's the first accessory I ordered for my RC and it makes the RC a useable camera. If you don't need the compactness of the Olympus 35 RC (which I do recommend) you could pick up a Konica Auto S2 or Minolta HiMatic 7S for less. Konica is shutter priority or manual and Minolta is program plus manual. Will work manually without battery. You can skip automatic exposure altogether with the Yashica Lynx series. Match needle with battery only needed for metering. Be aware that unless you buy one that has been restored these cameras may need a CLA for work properly. 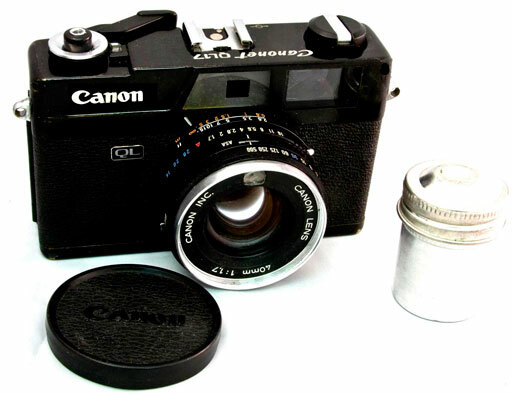 A Canonet QL17 might fit the bill, if you can find one in working order. However, I really recommend you get your hands on a few rangefinder cameras before parting with cash. The tiny peephole that passes for a viewfinder isn't to everyone's liking, and the rangefinder itself (split or superimposed image) is a matter of preference. Even more so if you wear spectacles. You might also want to ask yourself what you think you're going to get from 35mm film that you can't get from almost any modern digital camera, with less ongoing expense, aggravation and effort. Another vote for a Canonet. There are variations on this, but all but the minimal versions (the 28) are good choices. The only problem with the 28 is that it is less "manual". For the Canonet QL17, if you search without GIII, you will find the older models. There should be 2: one with a 45mm lens, one with 40mm. The latter is practically identical to the GIII, except for that GIII badge, and the price - they're usually a lot cheaper. I quite like mine; mine isn't as pretty as JDM's black one, but the same model in silver. While I agree getting a Russian rangefinder is certainly an option, I'm actually not sold on whether they're cheaper in case you find rangefinder focussing is not for you. The fixed lens rangefinders mentioned keep their value very well, so reselling shouldn't be too hard. While the Russian rangefinders are much more variable in quality, so they're simply a bit more of a gamble. The Ricoh 500G is another option that is quite compact, similar to the Olympus 35RC (though also with f/2.8 lens). It seems to sell for reasonable prices. As Mike mentioned, many of these compacts may need some service, probably replacing the foam door seals at least. One thing going for the FEDs and Zorkis is that they use string seals. Actually, my FED doesn't even have seals. I was thinking of the Kiev, which has a string seal at the top of the film door. Just received what is, a virtually mint Olympus 35RD. Wow, what a beautiful camera, converted to use the Wein cell for the meter, which is spot on readings-wise compared to the metering system in my Olympus E-M1 Mark II digital camera, finder cleaned and adjusted and is crystal clear with very nice rangefinder contrast. Can't wait to run a few roles of B&W film through it.